The aim of this paper is to examine whether a hybrid approach of parallel computing, a combination of the message passing model (MPI) with the threads model (OpenMP) can deliver good performance in streamer discharge simulations. Since one of the bottlenecks of almost all streamer models is the solution of Poisson's equation, we focused on several direct solvers, which can solve large sparse systems in parallel. For this purpose, our basic thought was to concentrate on 'easy to get' performance improvements, or, without rewriting of the code. We have investigated in PARDISO, a shared memory solver, and CLUSTER SPARSE SOLVER and MUMPS, which both can apply hybrid parallelism; the latter two solvers can be called from a single core and do not require minor awareness of MPI. We show their performance for solving two- and three-dimensional Poisson's equations on the Dutch national supercomputer, called Cartesius. A runtime study of a code developed for streamer propagation nearby a dielectric rod is included. We discuss various issues that appear to be critical in a mixed MPI-OpenMP environment. Nool, M, Genseberger, M, & Ebert, U. M. (2017). 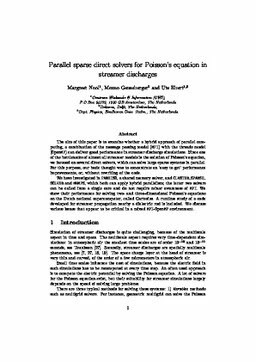 Parallel sparse direct solvers for Poisson's equation in streamer discharges. Multiscale Dynamics [MD].